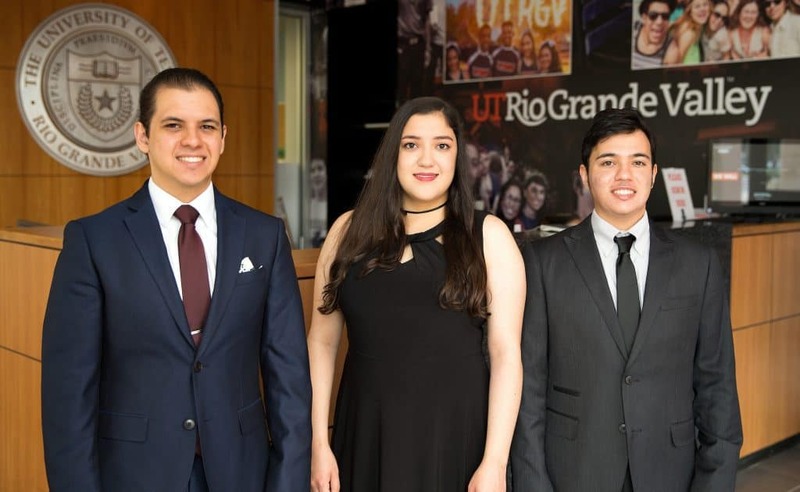 Featured, from left: University of Texas Rio Grande Valley students and triplets Zachary, Victoria and Joshua Pérez from Edinburg who have shared every graduation since kindergarten. But their Saturday, May 12, 2018 commencement ceremony probably was their last together. All three are biology majors, but each had chosen a different path for the future. Zachary is pursuing a Master’s Degree in Biology at UTRGV; Victoria will continue at UTRGV to pursue a Master’s Degree in Manufacturing Engineering; and Joshua will attend the UT-Austin College of Pharmacy. On Friday, May 11, 2018 and Saturday, May 12, 2018, UTRGV held two days of the Spring 2018 Commencement ceremonies honoring 3,100 graduates. The Edinburg Mayor and Edinburg City Council, along with the Edinburg Economic Development Corporation and its Board of Directors, lobby the Texas Legislature and the UT System Board of Regents on matters that benefit and protect UTRGV and its School of Medicine, which have major campuses in the city. Edinburg’s retail economy during March 2018 registered an almost 12 percent improvement over the same month in 2017, the best showing among all major Valley cities, the Edinburg Economic Development Corporation has announced. All figures for Edinburg, along with every other governmental entity in Texas which collect a local sales tax, are provided by the Texas Comptroller of Public Accounts. The most recent findings are based on sales made in March 2018 by businesses that report tax monthly, and sales made in January, February and March 2018 by quarterly filers. The amount of local sales taxes collected helps reflects the strength of an economy, along with construction activities, per capita income, education, historical performances, and related trends. The local sales tax is also used in Edinburg to help pay for many city services, while the Edinburg Economic Development Corporation uses its one-half cent local sales tax to help generate economic development in the city. Edinburg’s retail economy in March 2018 produced $2,203,439.47 in local sales taxes, compared to $1,969,548.16 in March 2017 – representing an improvement of 11.87 percent. Under the reporting system maintained online by the Texas Comptroller of Public Accounts, for all public entities which generate local sales taxes, year-to-date totals begin in November of each year. Between November 2017 and March 2018, Edinburg’s retail economy has generated $9,429,498.70 in local sales taxes, compared with $8,858,482.10 from November 2016 to March 2017, an improvement of 6.44 percent. In terms of local sales tax revenue for March 2018, McAllen led all major Valley cities with $6,008,612.24, while Brownsville was second ($3,783,437.27), Harlingen was third ($2,306,427.26), and Edinburg was fourth ($2,203,439.47). The sales tax, formally known as the State Sales and Use Tax, is imposed on all retail sales, leases and rentals of most goods, as well as taxable services. Texas cities, counties, transit authorities and special purpose districts have the option of imposing an additional local sales tax for a combined total of state and local taxes of 8 1/4% (.0825). Texas Comptroller Glenn Hegar on Wednesday, May 9, 2018, said he will send cities, counties, transit systems and special purpose taxing districts $861.8 million in local sales tax allocations for May 2018 – 9.4 percent more than in May 2017. The local sales tax data is among the latest economic barometers featured in a detailed summary provided by the state comptroller’s office. Among its many duties, the Texas Comptroller’s office is the state’s chief tax collector, accountant, revenue estimator and treasurer. • Weslaco: $1,284,079.39, up 5.24 percent compared with March 2017 ($1,220,128.40). • Weslaco: $5,393,024.32, from November 2017 through March 2018, up 3.48 percent compared with November 2016 through March 2017 ($5,211,513.54). For details on local sales taxes generated in March 2018 by individual cities, counties, transit systems and special purpose districts, visit the Comptroller’s Monthly Sales Tax Allocation Comparison Summary Reports. The Pérez triplets have shared every graduation since kindergarten. But their May 2018 commencement ceremony at UTRGV probably will be their last together. Joshua, Zachary and Victoria – all biology majors from Edinburg – graduated from UTRGV on Saturday, May 12, 2018. Now, each will take a separate path. As students at Robert Vela High School, all three were in orchestra, and it was no secret they were triplets even though they’re not identical. And at the university, it’s unusual for professors to pick up on the fact that they’re even related because they don’t look at all alike. Throughout college, they often had classes together, or they would take one class a semester before or after one of the siblings. Sharing books and notes from previous classes and studying together was the norm. In fact, Zachary and Victoria Perez were lab partners for the better part of two years. Apparently, two (or three) minds are better than one for cramming. In the fall, Zachary is pursuing a master’s degree in biology at UTRGV. After that, he has his eyes on medical school. Victoria will be pursuing a master’s in manufacturing engineering at UTRGV. She hopes to one day develop technology that helps people with certain medical conditions. “I want to help people, but I don’t want to work with them directly,” she said. Zachary, on the other hand, said he doesn’t mind working with people. Joshua will attend the UT-Austin College of Pharmacy in the fall. It will be the first time he leaves their native Edinburg, and the first time he seeks an educational endeavor without his two siblings by his side. More than 2,000 prospective graduates moved their tassels from right to left to signify the completion of their degrees, during the second day of the University of Texas Rio Grande Valley’s Spring 2018 Commencement ceremonies on Saturday, May 12, 2018. Held at the McAllen Convention Center, friends and family packed the facility for three ceremonies, 9 a.m., 1 p.m. and 5 p.m., as the Vaqueros walked the stage to cheers and applause. Dr. Patricia Álvarez McHatton, Executive Vice President for Academic Affairs, Student Success, and P-16 Integration, who led the ceremonies, enthusiastically congratulated the Vaqueros on their special day. “UTRGV Class of 2018, congratulations, and ‘Forever Orange,’” she said proudly, holding up her fingers in the university’s spirited “V” formation. “Remember, your contributions will build the future, bring innovation, serve our communities, transform the Rio Grande Valley, the state of Texas, the country and, yes, you will inspire the world,” she said. Between Friday, May 11, 2018’s ceremony in Brownsville, which included more than 700 graduates, and Saturday’s ceremonies, UTRGV graduated more than 3,100 students. Since UTRGV opened in 2015, the university has awarded more than 12,800 degrees. Dr. John Krouse, Executive Vice President for Health Affairs and Dean of the School of Medicine, who spoke at two of the three Saturday ceremonies, shared some valuable advice with the prospective graduates. Graduate Alyssa De León, from San Benito, said she always knew she would graduate with a degree from the UTRGV College of Sciences. She originally was a chemistry major, but it wasn’t until last year that she decided to switch to biology. She said the decision was impulsive, but it was the right thing to do. For graduate María Neyra, a Los Fresnos resident, the road to earning her degree had its bumps, but she got it done with perseverance and support from family and friends, who were with her every step of the way, she said. Neyra, who never gave up on her dream of earning a degree, said it took her five years, and now that she is done, she plans to follow her first passion – teaching. Neyra is applying with Teach for America and would like to stay and work in the Rio Grande Valley. The Mass Communication major had some advice for university students. J. Edward Moreno and Melissa Vázquez contributed to this article. For more information on the Edinburg Economic Development Corporation and the City of Edinburg, please log on to http://edinburgedc.com.